Although there is a wide range of various shavers for women, shavers for men are often limited to the standard face shaver. There aren’t many shavers tailored to handle every type of men’s body hair. Thankfully, Phillips Norelco’s new shaver may usher in a new age of shavers for men. The Norelco Bodygroom Pro is pricey at $70, but it brings many new shaving opportunities for men who need fast and easy hair removal. It is an evolution of the original Bodygroom, which also received rave reviews from Popular Mechanics magazine. For men who really need the hair on their back and chest removed quickly, the Bodygroom is a more efficient tool than many of the other options available. The main head consists of razor blades covered by a piece of foil, stuffed between two clippers. Unlike the original Bodygroom, the pro edition uses a 3D pivoting head that neatly adjusts to the contours of a person’s skin. 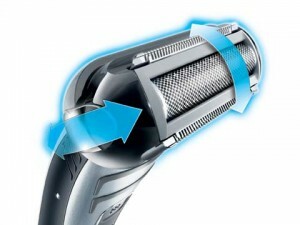 The pro model also changed the bottom of the shaver by adding a trimmer. This attachment is specially designed to shave off the coarsest hairs near the pubic section. The trimmer also has a handy adjustable trimmer guard. It is adjustable from 1/8 to 11/25 of an inch. This especially helps if people are having trouble combing with thick, tangled-up hair. The shaver also has plenty of other nifty features. It is water resistant, so men could shave in the shower. The water can lubricate the skin, so that the shaver can cut the hair cleanly across the skin. People can also set the shaver on the recharging base, to keep it fully charged. When completely powered up, the shaver can stay on for about 50 minutes. The long-lasting charge is especially handy for long hair removal sessions, when men have to shave off lots of hair in one session. The Bodygroomer is very easy for men to use, as long as they are patient with the shaver. The hair often pulls very easily, so people sometimes feel pain when they are trying to take off bushes of hair. Thankfully, the dual-end head works very well for people shaving in either direction, with or against the grain. Although many guys wouldn’t want to shave their chest or the forest in the pubic area, hairlessness is starting to become a hipper trend than usual. Askmen.com has already acknowledged that today’s hairy trends range somewhere between the overgrown forest and the bare, uprooted desert. Now is a great time for men to try out this product, if they are looking for a shaver to suit their desire for hairlessness. The bodygroomer might not offer nearly as permanent results as an epilator, but it is definitely one of the more efficient shavers on the market. Many users have given positive reviews over the web on the Bodygroomer Pro. Even if shaving doesn’t seem like a man’s cup of tea, this new Norelco product might easily change his mind.